"Kalispel" redirects here. For the city in Montana, see Kalispell, Montana. 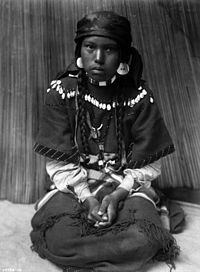 The Pend d’Oreille, also known as the Kalispel, are Indigenous peoples of the Northwest Plateau. Their traditional territory was around Lake Pend Oreille, as well as the Pend Oreille River, and Priest Lake. Today many of them live in Montana and eastern Washington. The Kalispel peoples referred to their primary tribal range as Kaniksu. It extended from roughly present-day Plains, Montana, westward along the Clark Fork River, to Lake Pend Oreille in Idaho, and the Pend Oreille River in eastern Washington and into British Columbia (Canada). They are generally divided geographically and culturally in the Kullyspelm (Upper Kalispel "Pend d’Oreille") and the Silkatkmlschi (Lower Kalispel "Pend d’Oreille"). The Upper Kalispel people are now enrolled in the federally recognized Confederated Salish and Kootenai Tribes of the Flathead Nation in Montana. The Lower Kalispel people are now enrolled in the Kalispel Tribe of Indians in Washington. Some Kalispel are enrolled in the Confederated Tribes of the Colville Reservation in eastern Washington. The name Pend d’Oreille (French: [pɑ̃ dɔʁɛj], "hangs from ear") was attributed to them by French colonists and traders in reference to the large shell earrings worn by these people. The name Kalispel is an anglicization of their name in their own language Ql̓ispé (Salish pronunciation: [qəˀlispe], which means "Camas People." Camas is a root that was a staple of their diet. Their language, Kalispel-Pend d’Oreille, is a Southern Interior Salish language. It is also known as Flathead-Kalispel. The Pend d'Oreille people have two reservations: the Flathead Indian Reservation in western Montana and the Kalispel Indian Reservation in Washington. Also, a small number of Kalispel people live on the Colville Indian Reservation in Washington. The main part of the Kalispel Reservation is northwest of Newport, Washington, in central Pend Oreille County. The main reservation is an 18.638 square kilometres (7.196 sq mi) strip of land along the Pend Oreille River, west of the Washington–Idaho border. There is also a small parcel of land in the western part of the Spokane metropolitan area in the city of Airway Heights, with a land area of 0.202 square kilometres (50 acres). This is the site of Northern Quest Casino, which is operated by the tribe. The total land area of the Kalispel Indian Reservation, located at 48°21′16″N 117°16′25″W﻿ / ﻿48.35444°N 117.27361°W﻿ / 48.35444; -117.27361 in Pend Oreille County, is 18.840 square kilometres (7.274 sq mi). The nearest outside community is Cusick, near the south end of the reservation. The Pend d'Oreille people are believed to have migrated south from British Columbia. In 1809, the North West Company established a trading post in their territory, calling it Kullyspell House. Jesuits established a Roman Catholic mission there in 1846. In 1855, the tribe split into the upper and lower divisions, with the upper moving to the Flathead Reservation in Montana. One of the two lower bands joined them in 1887. These people made their weapons and tools from flint, and many other things were shaped with rocks. For housing, the Pend d’Oreille lived in tipis in the summer, as well as lodges in the winter time. These houses were all built out of large cattails, which were in abundance where the people lived. These cattails were woven into mats called “tule mats”, which were attached to a tree branch frame to form a hut. Today a large community building on the Kalispel reservation bears the name “Tule Hut” in reference to this traditional housing. The tribe traded bison hides for horses and other useful goods. They traditionally made clothing from rabbit pelts and deer hides. They embellished hides with dyes, paints, beads, and porcupine quills. The Upper Pend d’Oreille of the Flathead Reservation became engaged in a dispute over off-reservation hunting between the tribes and the state of Montana, resulting in the Swan Valley Massacre of 1908. Long after they were dispossessed of their hereditary lands around Lake Pend Oreille, the Pend d'Oreille band of Kalispel continued to gather for an annual pow wow on its traditional grounds just east of what is now Sandpoint City Beach. The three-day event included ceremonies, dancing and traditional stick games. The pow wows in Sandpoint were discontinued in the early 1950s. Since 1975, the Kalispel Tribe has held an annual pow wow at its Usk, Washington, reservation in July or August. The events are open to the public and include a dance contest, traditional foods, stick games and others. ^ a b "Kalispel-Pend d’Oreille." Ethnologue. Retrieved 5 Aug 2013. ^ Fritz, Jane (Summer 1997). "Land of the Kalispel". Sandpoint Magazine. ^ "About Our Tribe". Kalispel Tribe of Indians. Beaverhead, Pete, and Dwight Billedeaux. Mary Quequesah's Love Story: A Pend D'Oreille Indian Tale. Pablo, MT: Salish Kootenai College Press, 2000. ISBN 0-917298-71-3. Boas, Franz (1917). Folk-tales of Salishan and Sahaptin tribes. Published for the American Folk-Lore Society by G.E. Stechert & Co. Available online through the Washington State Library's Classics in Washington History collection. Includes Pend d'Oreille tales by James A. Teit. Carriker, Robert C. The Kalispel People. Phoenix, AZ: Indian Tribal Series, 1973. Confederated Salish and Kootenai Tribes of the Flathead Reservation. Sk"sk"stulex"s Sqélix: Names Upon the Land, a Tribal Geography of the Salish and Pend D'Oreille People. Pablo, MT: The Committee, 1996. Lacy, Thomas F. (1994). Kaniksu, Stories of the Northwest. Keokee Company Publishing. Wikimedia Commons has media related to Kalispel. This page was last edited on 7 January 2019, at 02:33 (UTC).